Resources Unlimited is one of the leading Everything DiSC profile providers in the United States. 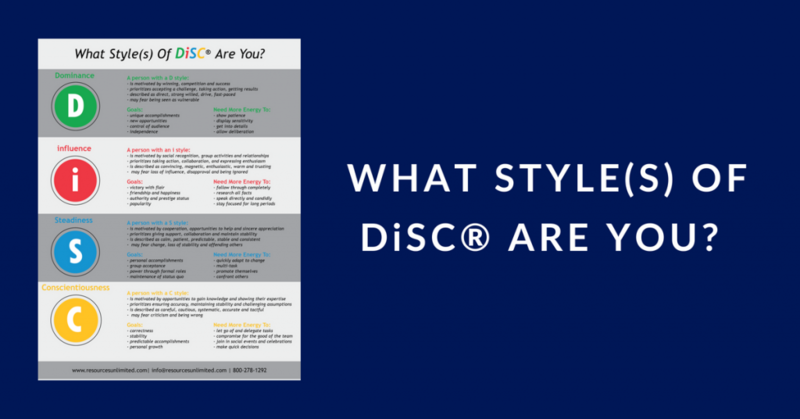 What DiSC® Style(s) Are You? Once you know your DiSC style you will start to learn about how you like to be communicated with, you will learn more about what motivates you, what stresses you, etc. You will become more self-aware. Take that a step further and imagine if you knew your bosses, co-workers, or friends DiSC style? This could be the missing puzzle piece with communication issues. Interested in knowing your DiSC style? Download our white paper to give you an idea of what each letter stands for. Each letter breaks down behaviors, stressors, motivators and priorities! We hate to toot our own horn but we are one of the leading DiSC® profile providers in the United States. Your success matters to us, so when you give us a call, you will get a REAL person on the phone. Together, we will figure out exactly what you need and help you get started on achieving your goals! Our team of highly trained experts will provide you with a 3-step plan to solving your problem. You will need to schedule a FREE consult. On that call we will assess your needs and get a better understanding of what your problem is. Based off our consult, we will put together a custom plan. Our recommendations will be based off the problem you are trying to solve. You take the recommendations and execute on the plan. We will be available through the entire process and will schedule a 90-day follow up.